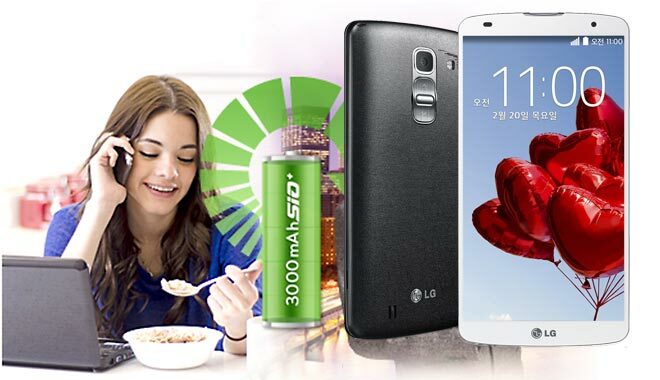 With the full review of the LG G Pro 2 now complete, it’s time to turn your attention to our battery test and see how LG’s latest phablet fares. One of its main competitors is going to be none other than the Samsung Galaxy Note 3, so it’s going to have to do well to stand a chance. There are some differences, too. The LG G Pro 2′s 5.9″ display isn’t only a bit larger than the Note 3′s 5.7″, but it is also a True IPS+ LCD, not Super AMOLED. On the software side, both are running Android 4.4 KitKat, so we’ll see how much of a good job LG has done on its Optimus UI and if it’s as power efficient as the TouchWiz UI on the Note 3. Starting up with the talk time battery test. 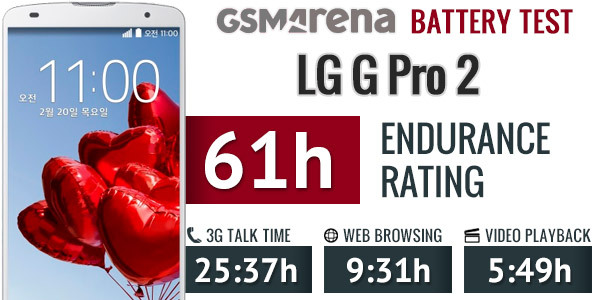 Here, the LG G Pro 2 scored the great 25 hours and 37 minutes. That’s way ahead of the Note 3′s score of 18 hours and 12 minutes. The HTC One max is close by at 22 hours and 13 minutes. Next up is web browsing, where the LG G Pro 2 achieved another respectable result. At 9 hours and 31 minutes, it’s virtually identical to the Galaxy Note 3. However, the video playback test wasn’t so successful for the LG G Pro 2 and the phone scored the pitiful 5 hours and 49 minutes. That’s quite ironic, considering it’s flexible brother, the G Flex, tops the chart with nearly 20 hours of video playback. We did re-run the test, but the result was pretty much the same, leaving us to think that something’s not particularly optimized in the video playback department. Hopefully, LG will take care of that with a software update shortly. All things considered though, thanks to its stellar stand-by performance, the LG G Pro 2 scored an endurance rating of 61 hours. This means the phablet will last you two and a half days if you used it for one hour of video playback, one hour of 3G talks and one hour of web browsing each day.